SWAT 4 devs talk environmental storytelling, authenticity, and going against the grain. Today marks the digital return of SWAT 4, originally released in 2005 and developed by Irrational Games; a studio that needs little introduction due to its work on such titles as System Shock 2, BioShock, and BioShock Infinite. To mark the occasion, we got in touch with Paul Hellquist and Bill Gardner – part of the core design team on SWAT 4 – to talk about their experiences creating the game, and what they're up to now. Tell us about your role in the development of SWAT 4. Paul Hellquist: SWAT 4 was my first time as a Lead Designer and a great game to cut my teeth on. Because our design team was only three people, it was an "all hands on deck" sort of project. Ian Vogel and Bill Gardner did the lion's share of the level design and I was responsible for the weapon balance, mode balance, the scenario editor, and coordinating the team with art and code to bring everything together. On top of that, I also built three levels, so I touched a little bit of everything. Bill Gardner: I was the Level Designer for six of the missions and the Meat Barn multiplayer level, and looking back that's a big list! The project actually had two major phases; getting single-player to a near-ship state, and then - my chief responsibility - updating every level to add co-op. It was a hugely educational phase, forcing me to shift my thinking to accommodate different styles of play, and also tons of fun since I got to play co-op almost every day. The design team was a mere three people, and it's really amazing what we were able to accomplish with such small team. After nearly 12 years, SWAT 4 continues to appear on "Best of" lists. Why do you think it holds such a strong place in people's memories? PH: The first element that Irrational brought to the tactical shooter is simply that you are a civilian police officer protecting your city, not a soldier overseas or killing everything that moves. Police have regulations to follow and their goal is to bring everyone in alive, including perpetrators. The less-lethal aspect of SWAT's gameplay helped the franchise stand out, especially from the Rainbow Six series; our chief competitor at the time. Environmental storytelling is the other key element we brought to the genre. Sierra originally pushed for a high-level story connecting all missions and culminating in the takedown of some terrorist group or crime syndicate. In reality, every SWAT mission is a unique and special situation. We wanted to capture that feeling by letting the details within each setting tell the story behind the mission. As a result, some of those locations have made lasting impressions with fans, like the cultist compound with graves in the basement, or the split-level ranch with the old lady whose son is a serial killer keeping women in the septic tank. BG: That's hugely flattering and really means the world to me. I think a big reason was that we had a tight-knit team firing on all cylinders that knew exactly what it wanted SWAT 4 to be. SWAT 3 provided a clear formula and we were able to add our own spin - the grit, mise en scene, the lived-in feel - elements that add up to create a cohesive world and experience. There are plenty of games out there that are perfectly well-tuned and play just right, but when you have a game that puts a little bit of signature on the experience, that goes a long way. 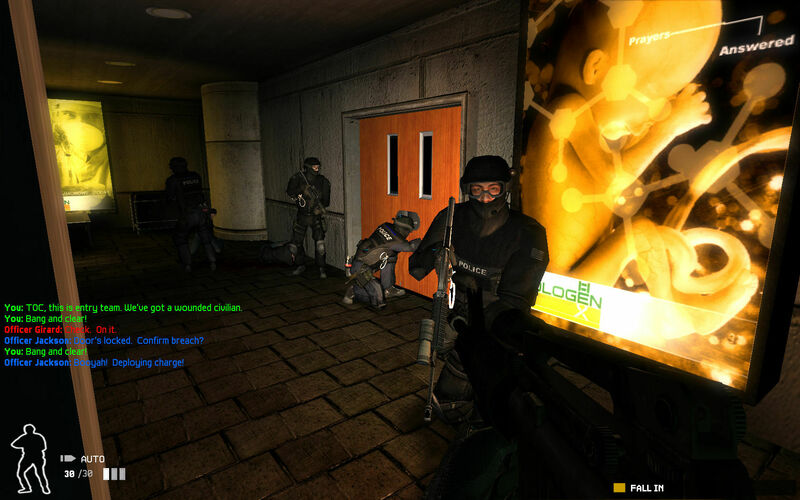 Besides making a great game, were there any other goals driving the development of SWAT 4? PH: Authenticity drove everything, and to that end we learned a lot from our consultant and retired LA SWAT officer, Ken Thatcher. I remember we showed him game footage and he immediately called out the problem of having your gun at your eyes - remember, this was pre-iron sights - because it reduced your vision. It especially bothered him that your gun was sometimes aimed at fellow officers. "You never point the barrel of your weapon at anything you don't want to die," he told us, which prompted us to add the low-ready animation, automatically dipping your gun when it panned past another officer. BG: BioShock would probably never have happened if not for SWAT 4. Before that, The Lost had been a failed project and the team needed a big win. SWAT 4 allowed us to bond while we built up our tech and confidence. We were all big fans of SWAT 3, but we saw a lot of opportunities for success and to put our mark on the franchise. The environments were quite sterile, for example, so that was a big opportunity that I saw. We used to say that SWAT was the one ray of light peering into a very dark world. We wanted to capture a lot of the same bleakness captured by David Fincher and movies like Seven, and I think we nailed that in lots of ways. We talk about SWAT 4 as an FPS, but the term almost feels a bit imprecise given the emphasis on non-lethal tactics and planning. Did you look to other genres for inspiration, or was this more a natural evolution of the subject matter? PH: It was more an evolution of the subject matter and our goals for authenticity. Other tactical shooters weren't exploring gameplay with less-lethal options, so we went deeper than was probably necessary, but we knew it was something unique and interesting. With regards to planning, it's also worth remembering that SWAT 3 was way ahead of its time with the in-game command system. 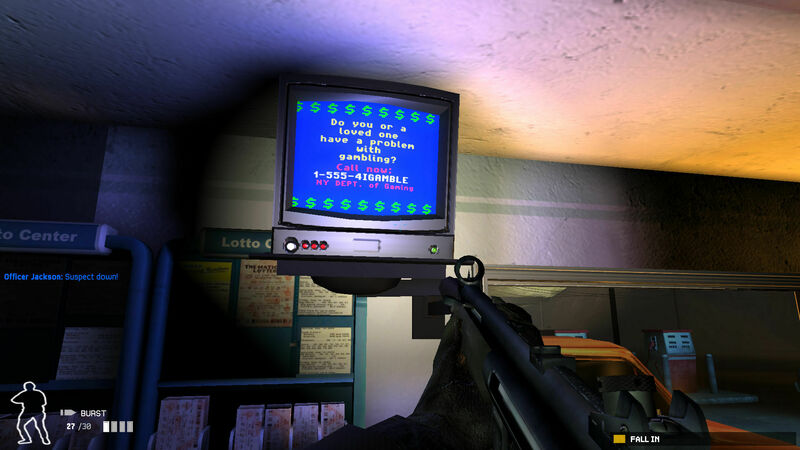 It's a bit clunky today, but SWAT 4 expanded the capabilities of that system and made it even easier to use. SWAT 4 was unique in that tactical shooters never really told stories in their environments, and people seem to genuinely care about the love we put into that world. BG: I think it's crucial to try to look everywhere for inspiration, and Irrational was a melting pot of ideas. When we pitched BioShock, for example, the mix of RPG and shooter was more exotic than you may remember. SWAT 4 was unique in that tactical shooters never really told stories in their environments, and people seem to genuinely care about the love we put into that world. And, at the time, the industry was moving in the direction of more frenetic, twitchy experiences. We weren't the first game to add planning or penalties for shooting first and asking questions later, but we were able to carve out a niche by making people slow down and think about their shots. Are there any trends from shooters during that period you would like to see return? PH: Real health systems. I am super-tired of health being a nebulous thing that magically returns when you hide behind a rock for ten seconds. SWAT didn't really have healing, and managing your health is something I miss. It's somewhat old-school and sounds like an old geezer's "Back in my day...!" story, but I also think every game started using that model just because it was considered the new standard, not necessarily because it was the right mechanic for the game. BG: I’m really pleased with how diverse the genre has become with games like SUPERHOT that add mechanics to drive the experience and get the juices flowing. I'm happy to see a focus on core ideas rather than trying to please everyone with 'kitchen sink' design. While it's great to have some games with mass-appeal, for a while shooters were visiting the same mine repeatedly and becoming so big they had to market to every gamer under the sun. With the growth of the indie space, and the reemergence of small- and mid-sized games, we’re seeing more high-concepts again, which is awesome! PH: I'm currently at Robot Entertainment in the Dallas, TX area and have been hard at work on Orcs Must Die! Unchained, which is in Beta and available to play for free on PC, and is coming soon to PlayStation 4. I've mostly been in charge of working with a couple of other designers on the various playable heroes in that game. It's been a fun change of pace from my previous projects. BG: For the past couple years, I’ve been cranking away at Perception a narrative horror adventure where you play as Cassie, a blind woman who uses echolocation to "see" through sound. After the BioShock series, I wanted to continue exploring in-game narrative and try to introduce a different perspective in first-person. Finally, I’m always looking for ways to give the horror genre a shot in the arm, and echolocation does just that, I think. When people play Perception, they often say "this feels very BioShock-y" and in a lot of ways, that’s intentional. I was at Irrational for 12 years, so I learned a ton and creating immersive experiences is part of my DNA. Look for the game very soon, but to learn more about it, check out my company’s website www.thedeependgames.com or Twitter account @TheDeepEndGames.